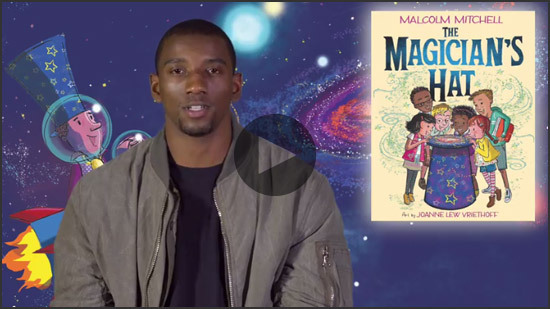 What do Malcolm Mitchell, wide receiver for the New England Patriots, Brian Selznick, creator of Wonderstruck (Scholastic, 2011), and Marley Dias, organizer of #1000BlackGirlBooks campaign, have in common? They all have books on the Scholastic Spring 2018 List and they can be found talking about their books on the Spring 2018 Online Preview: A First Look at New Books for All Ages. The Magician’s Hat (February) is a book that Malcolm Mitchel wrote to demonstrate the magic of books. In addition to being a professional athlete, Mitchell has created Read with Malcolm, an organization that encourages children to read. 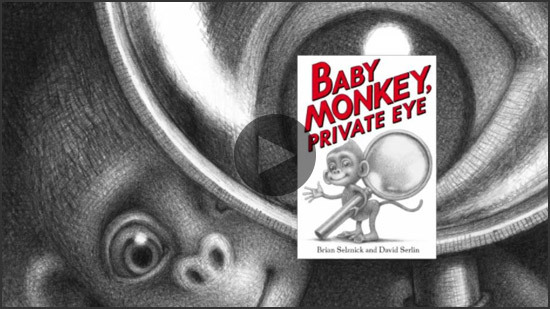 Of the 44 books on the list, Brian Selznick and David Serlin’s presentation for their book Baby Monkey, Private Eye (February) wins for the most humorous. Viewers will laugh their pants off. The 192-page beginning reader consists of 5 mystery stories about, guess who, Baby Monkey, a juvenile sleuth. The powerhouse girl wonder Marley Dias in her book, Marley Dias Gets It Done – And So Can You, (January) speaks to kids about her passion for making our world a better place, and how to make their dreams come true. There are several other titles this spring that also encourage kids to succeed. In Molly Bang’s Sophie Thinks She Can’t (January), Sophie is motivated by her teacher who tells her, “You haven’t figured it out YET.” Caldecott medalist Diane Dillon’s character Zoe tells readers that I Can Be Anything! Don’t Tell Me I Can’t (February). She can be an archaeologist, the president or even a librarian. We also find that even penguins need help in overcoming fears to succeed. In Be Brave, Little Penguin (December, 2017) Giles Andrea and Guy Parker-Rees give us Pip-Pip who is afraid to learn to swim. He succeeds with the belief and support of his mother. Historic women including Cleopatra, Amelia Earhart, Malala Yousafzai, and Frida Kahlo give inspiration to overcome obstacles in What Would She Do? : 25 True Stories of Trailblazing Rebel Women. Frida Kahlo also plays an important role in Me, Frida and the Secret of the Peacock Ring (March) by Angela Cervantes. This middle grade mystery was inspired by the author’s trip to La Casa Azul, the Mexican artist’s house. Another historic figure, Martin Luther King, is the subject of two books on the spring list. 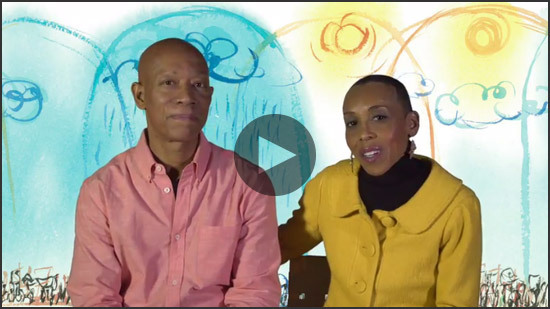 Husband and wife, Brian Pinkney and Andrea Davis Pinkney teamed up for Martin Rising: Requiem for a King (January). With the 1968 Memphis Sanitation Strike as background, Andrea Davis Pinkney has a series of “docu-poems” based on three words; peace, good, dream. Brian Pinkney’s illustrations are described as “visual poetry”. "the palette Brian uses for the jacket – the sunlit golds, ambers, and umber tones—signify the rising of a new day." Andrea Davis Pinkney’s favorite piece is the cover, on which Martin is looking majestically at the marchers below, “as if guiding them with his gaze, while at the same time drawing inspiration from their strength”. She also told School Library Journal that “the palette Brian uses for the jacket—the sunlit golds, ambers, and umber tones—signify the rising of a new day. That’s what Martin’s legacy does for us—it calls us to a higher purpose.” James L. Swanson’s Chasing King’s Killer (January) picks up with James Earl Ray’s assassination of King. In the book Swanson documents what is described as “the single greatest manhunt in American history.” The diversity of cultures serve as the basis for several books presented. Jean Kim using the Korean folklore that there isn’t a man in the moon but rather a bunny to create Rabbit Moon (January). In Saffron Ice Cream, Rashin Kheiriyeh taps her Iranian background to tell the story of girl who is becoming accustomed to her new Brooklyn home. The Serpent’s Secret (February) is the first book in the debut series, "Kiramala and the Kingdom Beyond" by Sayantani DasGupta. It is a middle grade fantasy featuring an intergalactic Indian princess. The author based her story on Bengali folktales she heard as a child. The book also shows the power of immigrant families. The Indian culture is also highlighted in debut YA novel Damselfly. Author Chandra Prasad’s story of survival has a group of private school students stranded on a tropical island. Another strong immigrant family, this time, Chinese, is featured in Kelly Yang’s Front Desk (May). Set in a hotel, there is Mia who staffs the front desk as her parents clean the rooms and hide immigrants. 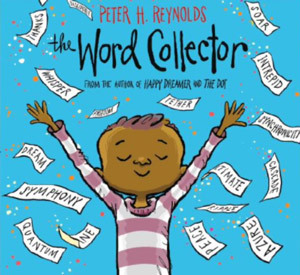 In January Peter H. Reynolds gives us The Word Collector (January). A fun book that features Jerome, a collector of words. Reynolds took some of the words from his own word collection and then just went on a hunt for more words over the course of writing the book. Some other fun words to say from the book are flabbergast, mollycoddle, squelch, plover and snuggery. Reynolds is a big fan of the word "ponder". “I always imagine a boy sitting on a big rock at the edge of a pond, looking down at his reflection as he ponders.” Although many creatures are featured on the list, such as, Ame Dyckman and Scott Magoon’s Misunderstood Shark (April). However, it is canine who takes center stage. With World War II as the background, Kirby Larson teams up a stray dog, a Navajo code-talker and a lonely girl in Code Word Courage (April). The “pooch with power” describes Tiny the little dog, from Sherri Dursky and Matt Myers Tiny and the Big Dig (January). Good Dog (March) by Dan Gemeinhart is about a dog who has died (no spoiler) who comes back to help his boy. Two Dogs in a Trench Coat Go to School (May) by Julie Falatko puts loyal pups Sassy and Waldo undercover. Finally, we have Ian Booth and Nina Matsumato’s graphic novel Sparks (February), a dog that is really two cats. You must read it to get it.